The Occupational and Safety Health Administration (OSHA) sets occupational health and safety rules and regulations in the United States. Many of these rules address employers’ responsibility to protect their workers from known hazards, which may include exposure to toxic chemicals, excessive noise levels, mechanical dangers, heat or cold stress, or unsanitary conditions. Equipment plays a proven role in workplace safety. Of some 770 workers who suffered facial injuries, only 1 percent were wearing proper protection, according to a study by the Bureau of Labor Statistics. Only 16 percent of employees who sustained head injuries were wearing hard hats. Such findings have led to laws requiring employers to provide PPE. Employers must also provide OSHA employee training in proper PPE use. Through programs such as Eastern Kentucky University’s Master of Science in Safety, Security, and Emergency Management (MSSSEM), students can gain detailed knowledge about worker safety. Graduates become valuable assets in helping their employers to comply with OSHA regulations. Despite the proven effectiveness of PPE, not all employees use it. Consistent use of PPE is essential to a safe workplace. Employers are not just legally but, many would argue, also ethically required to make sure all occupational health and safety rules and regulations are followed. “We have a moral responsibility to make sure that workers who showed up to work today are still alive to punch the clock tomorrow,” said then U.S. Secretary of Labor Thomas E. Perez in 2015. Explain the importance of PPE. If workers do not understand why a certain piece of PPE is necessary, they will not be committed to using it. Owners, supervisors, or safety managers should clearly explain the dangers of the work environment and describe what could happen if proper PPE is not used. Use case examples, if possible. Employees are more likely to protect themselves if they understand the consequences of noncompliance. Show proper use and fit. Correct handling of PPE can make the equipment more comfortable to wear and use. Companies should train incoming employees on all required PPE and provide periodic refresher sessions for long-term workers. Correct use and fit will not only increase comfort and compliance, they will also make the PPE more effective when hazards arise. Take employee input. Solicit employees’ opinions on model and brand of PPE. Encourage workers to consider style as well as comfort and functionality. If employees like the way their PPE looks and feels, they are much more likely to wear it. Being consulted also increases employees’ buy-in and commitment to using PPE. Get employees involved. Encourage workers to brainstorm ways to spread the word about consistent use of PPE. One suggestion is having workers create their own “Why I Work Safe” boards, where they post pictures of loved ones or even a favorite hobby they couldn’t do if they were injured. The boards can be placed where employees can see them daily and updated quarterly or yearly to provide new examples. Lead by example. Company owners or managers should wear their PPE when they are out on the floor or in the field, no matter how briefly. If management takes PPE seriously, employees will too. Educating workers before problems arise is the best way to encourage compliance in the use of personal protective equipment. 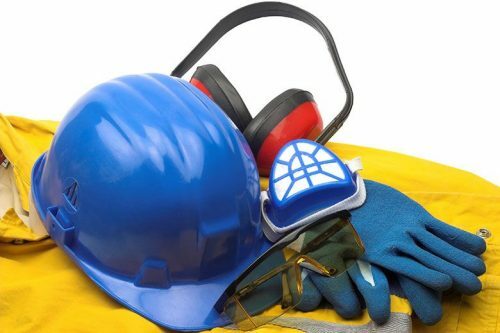 Encouraging the proper use of personal protective equipment within a company, organization, or government agency is one of the many critical responsibilities for which MSSSEM degree-holders are educated. EKU offers courses in emergency planning and response, security management, homeland security, industrial safety, crisis response, fire safety, and intelligence analysis to students interested in taking one of the university’s 3 MSSSEM concentrations: Occupational safety, emergency management, and homeland security. The fully accredited online emergency management degree program can prepare students to sit for their Associate Safety and Health Manager (ASHM) certification and the Certified Safety and Health Manager (CSHM) exam. For additional information, visit the EKU MSSSEM webpage today. Types of PPE: Safety Services Co.